The Driver and Wipers Memorial commemorates the thousands of Australian lives lost during the fighting at Ypres. "Wipers" was the way Australian and British servicemen pronounced "Ypres" during World War One. 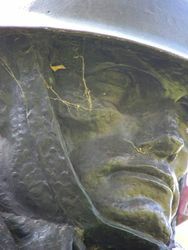 “Wipers” and “The Driver” statues were purchased by The Felton Bequest in 1937 and are the work of British sculptor Charles Sargeant Jagger. They were initially erected outside the Museum and State Library building in Swanston Street, and were transferred to the Shrine in 1998. 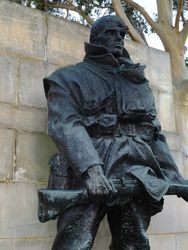 The "Driver" is a British soldier holding a horse whip and bridles, wearing breeches,a protective legging, spurs, and a steel helmet, and the figure is a recasting of one of the figures from the Royal Artillery Memorial in Hyde Park, London, United Kingdom. 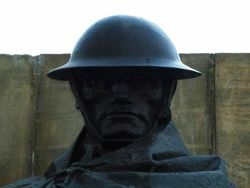 The other bronze, the "Wipers" figure, is a British infantry soldier standing guard with standard issue .303 rifle, bayonet fixed, a German helmet at his feet. 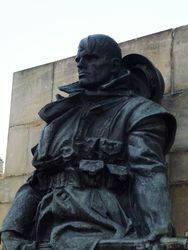 This is also is a recasting, taken from the Hoylake and West Kirby War Memorial in Merseyside, United Kingdom. Melbourne will have the only replicas of two war statues — "Wipers" and "The Driver" —by the late Charles Sergeant Jagger, when they are erected shortly in front of the Public Library. The Felton trustees acquired the copyright, and with it the plaster casts of the originals, which are figures at the base of the Royal Artillery memorial, Hyde Park corner, London. After the replicas had been made the casts were destroyed. The statues have reached Melbourne, and a sub-committee of the trustees of the Public Library, National Gallery, and Museum has inspected four sites in front of the Public Library. Two of the suggested sites are on the lawns, one in front or the portico and the other at the southwest corner of the building. The subcommittee will make a recommendation to the trustees at their meeting on July 30. Argus (Melbourne), 10 July 1936. The two statues by Charles Sargeant Jagger, acquired under the terms of the Felton Bequest, will be unveiled at the National Gallery and presented to the trustees by Mr. J. A. Levey, chairman of the Felton Bequests' committee, on Wednesday at 4 p.m. The Argus (Melbourne), 22 February 1937.